There’s a great deal on this budget graphics card, and it comes with 2 brand-new games for free. For all the joys of building your own rig, it can get a little pricey. If you’ve been putting together a PC on the cheap, we’ve got a tempting GPU deal to help you out. The Asus Radeon RX 570 Expedition 4GB is currently £139.99 on Box.co.uk, saving you £236 (although that price is likely inflated). However, the real highlight is that it comes with 2 free games—and you can choose from The Division 2, the Resident Evil 2 remaster, or Devil May Cry 5. We’d highly recommend jumping in if you’re looking to make your gaming PC on a budget; the card’s good value for money as it is (it features on our list of the best graphics cards), and each one of those games is brilliant. While it’s not going to play games at their best, the RX 570 is still a respectable choice that’ll get you playing at mid-range settings. 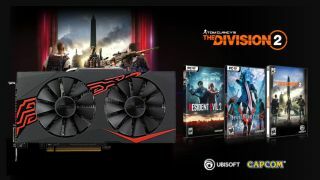 For instance, you should be able to play The Division 2 at its recommended specs—1080p at 60fps. What’s more, buying 2 of those new games separately would set you back £60-£80. Getting them for free is very much appreciated as a result, particularly with a reduction on the card as well. It’s a bargain all-round. For more component deals on the cheap, don’t forget to check in on our page of budget gaming PC builds.